Rev. Dr. Vicki Johnson, ACC, was introduced to coaching by being coached. In a dynamic and fruitful partnership with Chris Holmes, while serving an 8th year as lead pastor of a growing, downtown church, she completed a thesis project: “The Resilient Pastor: Leadership Practice in Crisis and Transition”. Vicki received her doctor of ministry degree (Wesley Theological Seminary/Lovett Weems) less than three years after the sudden, tragic death of her husband in 2011. Then as chair of the Board of Ordained Ministry, she brought the Coach Approach Skills Training to Mississippi for board leaders. Vicki is a perceptive, discerning, straightforwardly effective leader with 30 service years of experience in a wide variety of settings including Superintendent of the East Jackson District of the United Methodist Church in MS. A passionate life-long learner, she has also been trained and certified as an interim ministry specialist, spiritual director, and yoga instructor. 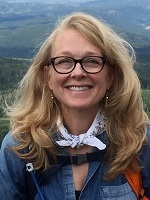 Now residing in Texas and Southwest Colorado (with frequent visits to Mississippi), Vicki enjoys hiking, mountain biking, and assorted other pilgrim-spirited adventures with her husband Roger. Together they have 7 children and 6 grandchildren.